86 I-CONNECT007 I SHOW & TELL MAGAZINE 2018 by Dan Feinberg FEIN-LINE ASSOCIATES Something special happened this year at IPC APEX EXPO in San Diego. A semi-secret group that most did not know existed was reborn. The Order of the PCB Dinosaurs (originally called the PWB Dinosaurs—the sign of a true dino) was born because of a comment almost 20 years ago by my good friend Bernie Kes- sler. Back in the day, when suppliers like us became IPC members, we could only be asso- ciate members; unlike fabricators, we could not serve on the board and we could not lead key committees. In the early '90s that started to change. I was asked to form and chair a new group, the IPC Suppliers Council. This group was at that time limited to the general manag- ers, presidents, and CEOs of the key suppliers to the industry. 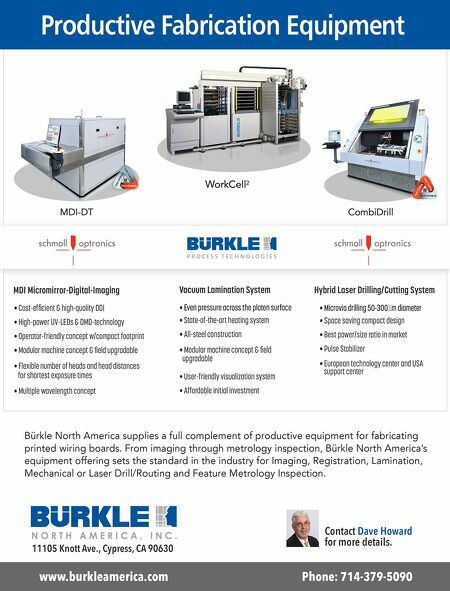 One of the first decisions we made was to recommend that IPC start its own show, IPC EXPO. The meetings, discussions, and the decision to proceed is another story in itself, but eventually the plan was approved. However, the decision to do so was not unani- mous. After the formation of the new show was announced, I had a discussion with Bernie regarding the reasons it would be good for IPC. He had not been in favor of IPC expanding into the show arena, but he was willing to support it. He said, "I guess I am now just a dinosaur, but I will give it a chance." We planned and had our first show in Boston; it was a success and the rest is history. In 1999, my parent company, Morton Thio- kol, sold Morton, which included Dynachem, to Rohm and Haas, and I decided not to move on to the new, combined company. I met with Bernie a few months later and told him that I guess I was now becoming a dinosaur too. 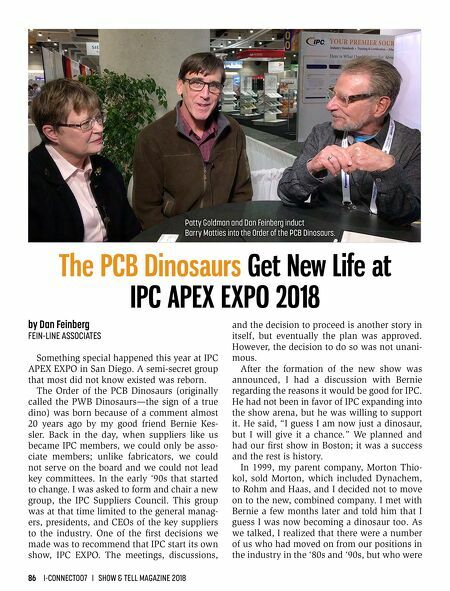 As we talked, I realized that there were a number of us who had moved on from our positions in the industry in the '80s and '90s, but who were The PCB Dinosaurs Get New Life at IPC APEX EXPO 2018 Patty Goldman and Dan Feinberg induct Barry Matties into the Order of the PCB Dinosaurs.